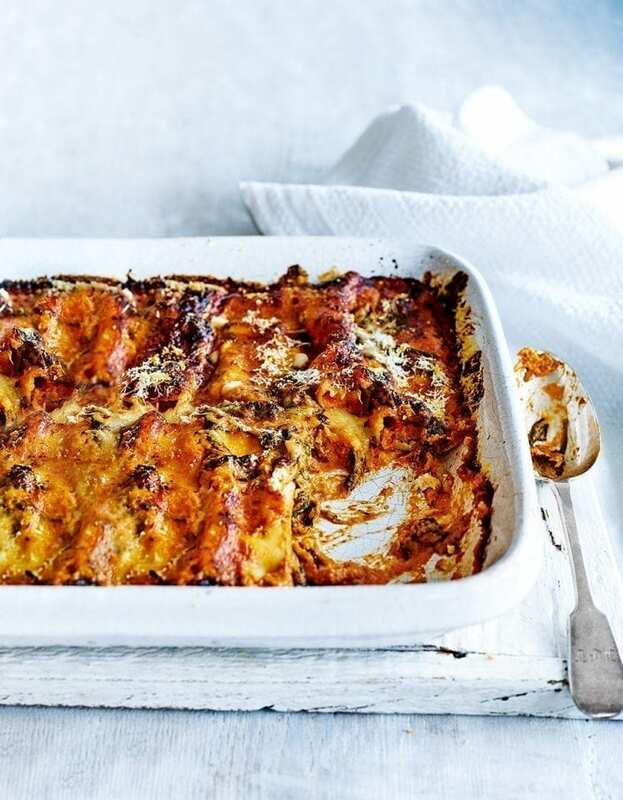 Use up leftover roast chicken in this comforting cannelloni recipe with spinach and ricotta. The recipe for two is quick, easy to make and perfect as a midweek meal. Heat the oven to 200°C/180°C fan/gas 6. Heat a glug of vegetable oil in a pan, then gently fry the onion and garlic for 3-4 minutes. Put in a mixing bowl. Add the ricotta, egg yolks and fresh sage leaves. Mix, season and stir in the chicken. Put the mixture in a blender and whizz to a pâté texture. You’ll need an ovenproof dish that can snugly fit in the pasta tubes (test it beforehand for size – a 1 litre dish should do). Spoon the smooth filling into the centre of the pasta tubes, then arrange them in the dish. Put the pasta sauce in a large pan, add the spinach and mascarpone. Gently heat until the spinach wilts and the mascarpone melts into the sauce, then mix well. Pour over the pasta tubes, top with the parmesan and bake for 30-35 minutes until golden and crisp on top and the pasta is cooked but still has a little bite. Make the filling up to 24 hours in advance, cover and store in the fridge until needed.